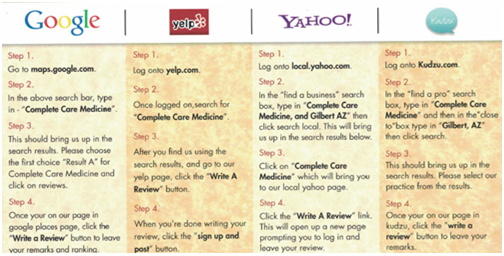 Complete Care Medicine / Complete Care Medicine / Leave a Review for a Chance to Win! At Complete Care Medicine, we love hearing from our patients and would like to offer a chance to give back to those who leave us a positive review. We have broken the year down to 4 quarters and will be doing 4 drawings a year for an iPad mini. Patients need to leave us a review in order to be entered. Once you have submitted your review(s), please email us at reviews@completecaremedicine.com to let us know which sites you’ve submitted review to. We look forward to reading your comments. See the directions below on how to leave a review on each of the review sites. Our Gilbert medical center looks forward to hearing from you!